@meppi64 I bought seasons 1 and 2. I added also The Addams Family to my collection. I'm probably going to buy five more Bally/Williams table. Currently trying to figure out what should I get. Fathom and Indianapolis 500 looks like fun as well Fish Tales. Finally, a way to play TATE mode with the Joycons. @Zkibu Very good to pick up Addams Family as it's certainly one of the most loved tables ever. Then again, Fish Tales, Indianapolis and Fish Tales are all excellent too and I didn't put them on there since you already mentioned them. See, that's the big dilemma with what's happening. When it comes down to it, you can make an argument for nearly every table on here although some will be more popular than others. So I really couldn't leave any behind and picked them all up on all my main devices just to be safe. I think the Xbox one version (and probably Steam version) will be the one that will be the most future proof since it's a safe guess that everything on Xbox One will just work on the next Xbox. But I still wasn't going to take that risk, so I bought everything on PS4 as well. And since Vita is the only portable that has all these tables, I got those also. And I have to mention Bram Stoker's Dracula, despite the table really not clicking with me at all so far. But then again, a ton of people seem to really love it, so it might just be me, or I might have to put more time into it to be able to see what makes it so great. So I couldn't leave it off in case it turns out to be one of your favourites down the line. I had the same thing happen with Last Action Hero from Stern to a lesser extent. Someone who plays a ton of pinball, in real life as well recommended it to me as I got Stern Pinball Arcade and I had the hardest time so far to get a table to click with me. It still doesn't really do it for me to be honest, but at least it's grown on my since the beginning. I'll keep at it I guess. I think it's a bit of off-topic, but as some of you guys are talking about Switch pinball games, does anybody know in which eShop the additional tables of Pinball FX3 or Stern Arcade Pinball are cheaper? As with DLCs, there is anything like eshop-prices to compare additional content's prices. @Moroboshi876 Pinball games are arcade games, so I don't see it as off topic at all. It's some of the most on-topic posts I've made here actually, so don't sweat it. Pinball FX tables will most likely be cheaper overall, well besides some of the licenced packs, I guess. But for the ones I feel are actually must have tables, those would be Ghostbusters and Star Trek on Stern. And even AC/DC as it's a brilliant table as well. But I'd put those other two about it for sure. Star Trek is a lot more newbie friendly than Ghostbusters, which can be quite brutal at first. Although, I have to say that since it's been released, Ghostbusters has become one of my absolute favourite tables of all time. But it does need some practice to get good at it, that's for sure. Do remember that all the Stern tables are coming to the regular pinball arcade, btw. Although if you can grab the physical release for Stern, which I've seen being sold for 22€ brand new, I'd certainly pick it up as the other tables on it are very good as well, besides Frankenstein, which I can't say anything good about sadly enough. Gonna nag you some more if you don't mind. Would it be possible to implement an extra rotation option to both Stern PA and the regular PA releases on Switch? Because as of right now, the orientation is the opposite of what the FlipGrip uses, so the tables would be upside down and unplayable with it. This option, alongside this new peripheral would make this version even more perfect. Oh and I know this is a long shot, but I noticed that the PS4 version seems to have gotten a trophy update somewhere down the line (hadn't played it in ages). Would it be possible to implement these as achievements in the Xbox One version as well, as it adds extra incentives to go after all the Wizard goals for each table. And right now only season 1 and 2 have them (Damn you Genie!!!). Would love to see a TATE mode for Xbox as well one day. Didn't have time to do this before as things have been crazy here the past few days with having people come in to install the new heat pump and airco system, not to mention the cleanup afterwards due to all the construction. 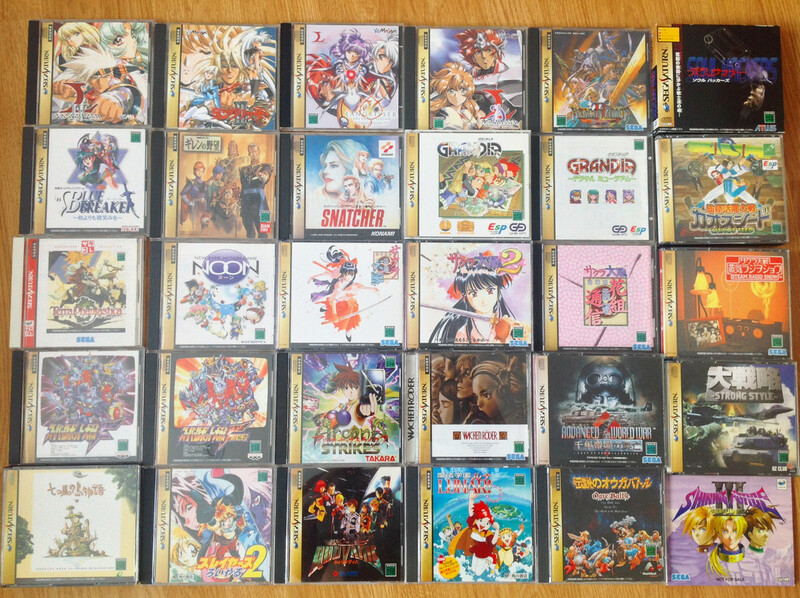 But I've just taken a couple of pics from most of my European Sega Saturn collection. I spread them all out since I'm a very visual person myself, so I love looking at these kinds of things, and they look so much better this way instead of just a stack of games where you can only see the spines. They might also help with future pickups of games that you might have forgotten about, or with any luck, some that you didn't know were on here. While I was at it, I did the same for my European Dreamcast games. Only a few games missing that I would want to add to the collection in the future. 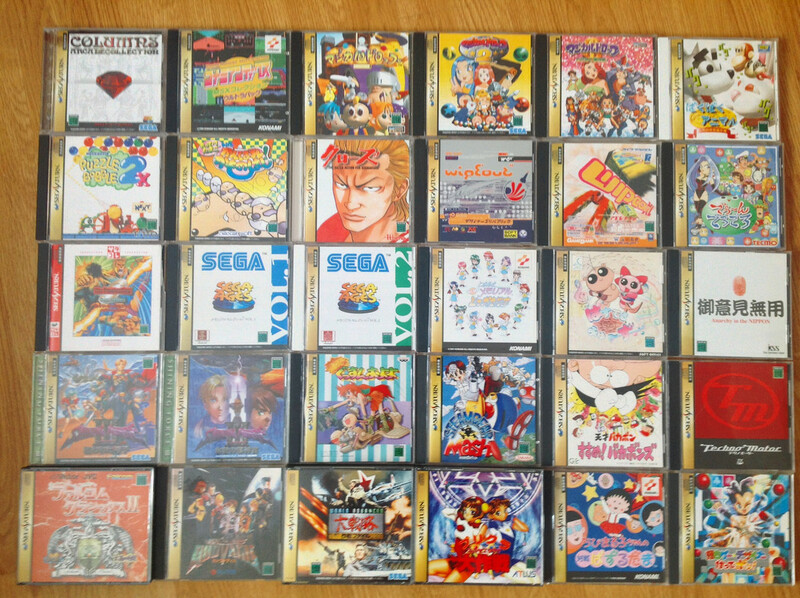 But ever since the Dreamcast was discontinued, I've been focussing on the Japanese counterparts for both the Sega Saturn and the Dreamcast, so I might have to do the same with my Japanse sets one day. Also came across an early buyers guide for the Sega Saturn to start to build up a nice collection with games that you can find really cheap. I swear I didn't see the video before I recommended a certain game highly to you. What can I say, this guy know his Sega stuff. @Meppi64 - That's fantastic, thank you! I agree, the cases look awesome. Still patiently (not patiently) waiting for my Saturn to turn up! I love Sega racers of that era so after Sega Rally, Touring Car and Manx TT are high on my list. I also love Athlete Kings and I see you have Exhumed, which I spent many hours on back in the day. I really wanna play lightgun games again, but need a CRT. I have a TV on a rotating wall stand for Switch shmups, and little room left in my small games room with pincab and MAME cab, but damn, I think I'm gonna have to get a CRT for the light gun goodness. I had one a while back for HOTD2 on DC and Time Crisis on PS2, then gave away my main DC to a mate (kept a spare that only reads backups, but no pads). I'm definitely gonna get a new DC I reckon. I have Ghost Squad, HOTD 2 & 3 on Wii, and HOTD 3 and 4 on PS3, but I really want to do it properly. EDIT: Just seen you have Confidential Mission! That's probably my favourite. It makes me want to cry, knowing I gave games like that away only about 2 years ago! They went to a very good home though. I need to build the DC stuff back up, what a console. @monkeyspasm Sorry about me making you want to spend even more money. There's just so much good stuff out on these two systems. It really is a shame that most people who think of themselves as gamers today either don't know about them, or try to downplay the importance of these two Sega systems in light of trying to make Sony look better because that's their company of choice and they will do everything possible to make them look as good as possible, not only towards todays competitors, but even towards competitors in the past of which they have nothing to fear. I actually have 3 big CRT TV still. They haven't been hooked up since I moved house, so for about 3 years now, but I'm planning on setting them up in the future when I get a separate space in the house ready for a retro corner. I really need to get a good quality LED tv one day to play TATE games on modern systems though. My main TV is a 65" latest generation Panasonic plasma, so I can't flip that one, and the previous one which is now boxed up is a 46" Panasonic plasma as well, so I can't flip that one either in fear of it messing with the gas inside. Ghost Squad was one of the best surprises I came across on the Wii. It's such an incredible light gun game. Certainly one of the best ever created. House of the Dead Overkill is also something really special, if for completely different reasons. It's a straight port of both games without any bells or whistles and the games are rather basic, but still a lot of fun. And the only way to play them at home. Some really weird hidden gems on the Wii came out of the blue and seemed to have been forgotten. Like Konami's arcade game GTi Club. My favourite Playstation lightgun game, or series actually has to be GunBullet or Point Blank. That was so much fun, especially in multiplayer. And one that's a little more popular, if you can call it that, at least with obsessive importers, is Zangeki no Reginleiv from Sandlot, the makers of the Earth Defense Force games, and one of my favourite games on the system. Sadly it's Japan only and the reason I had to softwood my Wii to play imports. Well alongside ExciteBots. Yeah, Ferrari 355 is something really special. Even today most games don't get the feel right quite like this game if you ask me. I have barely played Forza 7 so far, but yep, that was one of the tracks that I checked out, for the exact same reason. I'm gonna try and see if I can take a couple of pics of my Japanese sets tomorrow. Had a mare at first, to the point I contacted the seller about returning it! No games would boot past the Sega licensing logo, so i thought the lens was dead. I noticed my TV would turn blue quickly as if no signal, then go black and the drive stopped. After looking at Youtube pot adjustment videos, one of the comments said a SCART issue could cause problems, something to do with the Saturn not outputting enough power to switch the signal on modern TVs. Tried another TV and it booted first time, but with the game stretched on the top half of the screen and the bottom half corrupt. @monkeyspasm Now that's a wonderful Saturnday surprise! No idea that there was an issue with the RGB cables on new TVs. Is it an actual RGB cable from Sega themselves? It most likely is, but you never know. It should have the full 21 pins on the scart connector without any missing. Colour issues on screen do indeed imply a cable issue nearly all of the time. If you get some weird pink or blue tones at times which span the whole screen, try to wiggle your connectors. It tends to happen to Saturns as these cables and systems age. I know there was a seller on ebay that created brand new RGB cables for Saturn, Dreamcast, NeoGeo etc. Might have to look them up if you keep having issues. he might even have cables in stock witch fix this issue as I know he did N64 enhanced cables as well. It's a couple years ago since I looked him up though, so I don't know if he still does this. I think they even were called retro cables or something similar and were based in the UK. 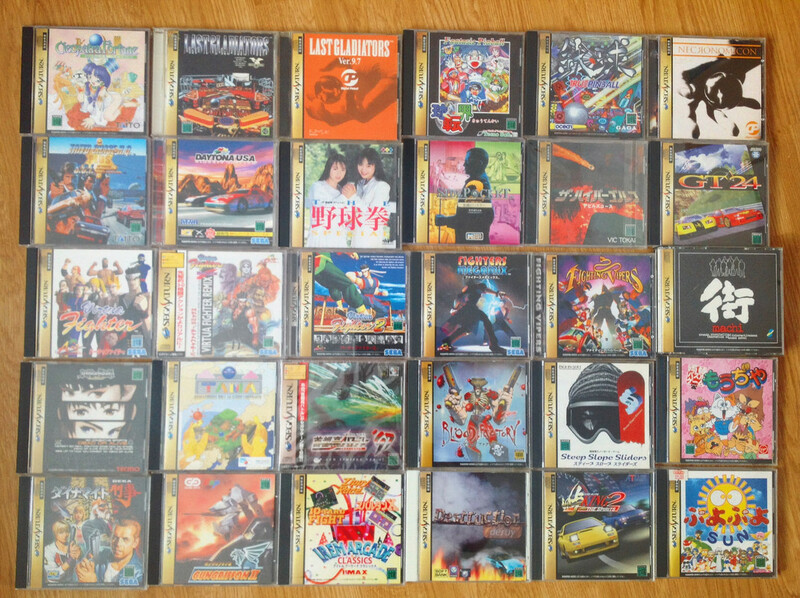 Just had a nice Sega Saturn evening myself. After playing some NiGHTS into Dreams on Xbox One, I wanted to see what exactly was the problem with that port, so I popped in the original. Not only is the control messed up in the HD versions, same as in the Japanese only PS2 port, since it's based of that one, the timing also is way off. The acceleration of your boosts and such doesn't act like it should in the remakes, sometimes going too fast, at other times, not speeding up enough. Really weird. On Saturn, even though the analogue stick feels incredible archaic at this point since we're used to so much better sticks for over years now, the controls, once you get used to the feel of the stick, is smooth as butter and you can, with some practice, pull off any more you deem necessary to keep a combo going in an effortless way that is simply impossible on any other system. 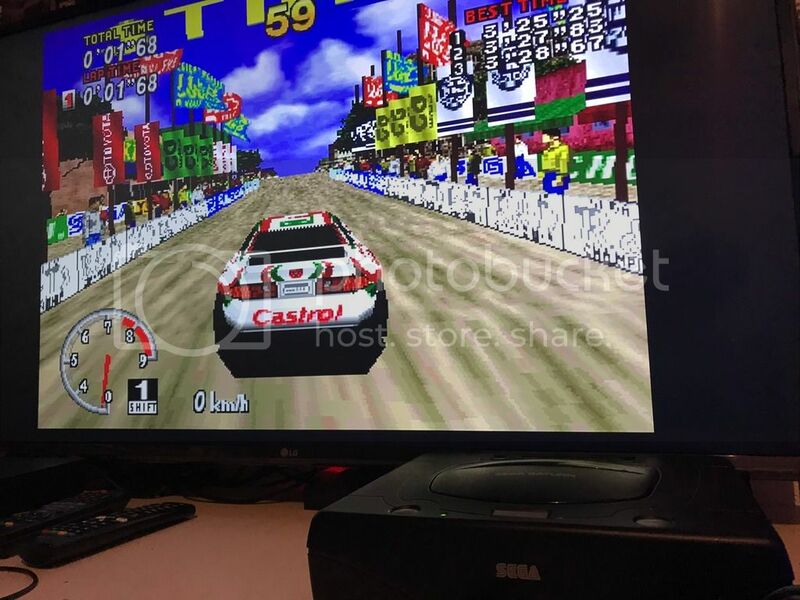 Then popped in Sega Rally to put in a few new times and grab a couple of pics, and before I knew it, I was playing that one more than an hour as well and it was past midnight already... Yep, the system is still as brilliant as ever, even nearly 25 years later. I concentrated on Desert and Forest as the Mountain track will surely give me a bit of grief as it always does when I haven't played in a while. These times shouldn't be anything really special. They were done with the Celica and automatic transmission, with every setting left on standard. 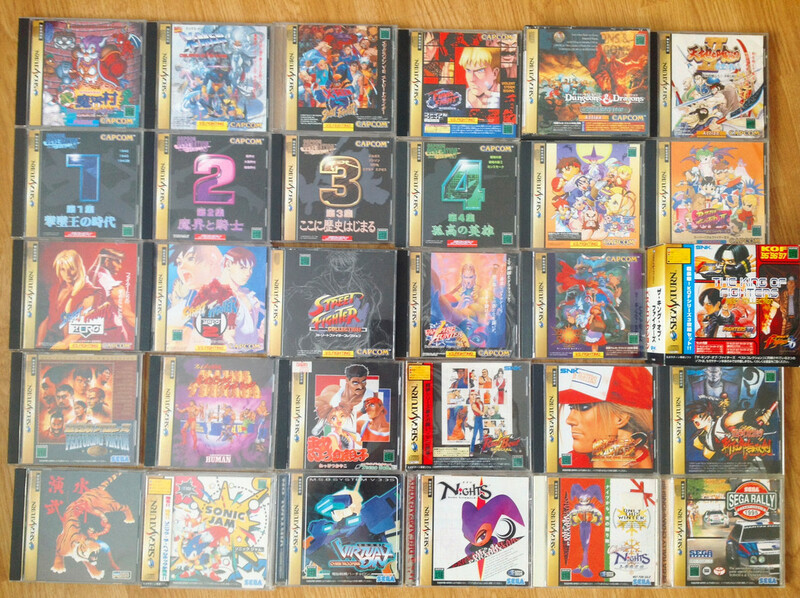 In case these times seem unrealistic to get to, let me know and I'll dig out the European Saturn as these were done on the Japanese system that's always hooked up. Edit: Imgur still doesn't work on this place. Seriously people, fix your forum software! I've always been a fan of emulation, having a MAME cab and virtual pincab, but there's just something about having the real console and game boxes. My games room isn't pristine, games are just piled on the floor under desks, but I think it has the vibe of an 80s video shop and I love it. I love the internet, it's amazing that we can still compete and have fun with these games 20+ years later! @monkeyspasm @Meppi64 Join up to our Adult Switch Gamers Discord. @naviandmii will happily create a thread for you guys to instant message your scores. @meppi64 Nice, I love these old systems too & play retro stuff on CRTs exclusively. I have a collection of a few - a couple of progressive scan units for DC, GC, PS2 etc. and a BVM, and others for 15Khz stuff. I just love that CRT glow, the way they resolve the image and that non-existent lag..
@monkeyspasm I've never been a fan of emulation myself, but over the years it has become very clear that it's something that is absolutely necessary due to various reasons. Code being lost, systems dying, discs and carts dying, games that never left the arcade, licensing issues prohibiting the re-release of tons of classics, etc. So despite still not using it at all, besides a couple of go's on ProGear no Arashi on PSP, I certainly have changed my mind on the issue. Still not a fan of the whole hacking systems, especially not current ones like we see now with the Switch as that's a terrible thing for the industry overall, but there's no denying that emulation is doing a ton to preserve games that would otherwise be lost forever. I don't have a facebook, but I do have Twitter, one personal account that I only use to upload screen caps from my Switch and one for my website, to tweet out when a new magazine is finished and ready for download. @Lroy Sounds good, I logged in a day or two ago to bookmark it, so that might be an easy way to do these kinds of score challenges. The only problem I see with putting it on a separate system that's kinda hidden away is that it'll be impossible to get others interested in joining up if they want to. But I do understand that putting it all in here kinda messes up the overall thread. Although I consider the Sega Saturn and Dreamcast to be home arcade machines, so it kinda fits. After all, the only similar system that could hold that title would be the Neo Geo. Man, I wish for a time where a bunch of us here would be able to all get Dreamcasts and do some serious Crazy Taxi score chasing. That's such a perfect game for it with a very high skill ceiling. It comes and goes for me. Sometimes, due to the incredible amount of new stuff there is to play, I go extensive periods of time without touching my old systems. But every single time, those new experiences start to drag after a while and I need to recharge my batteries. That's when I always return to my older systems, especially the Saturn and Dreamcast. Playing some Crazy Taxi, Sega Rally, Batsugun, Giga Wing, Mars Matrix or NiGHTS quickly returns my passion for this hobby when it starts to dwindle. This is also the same reason why I played basically nothing but my Switch for the past year, till I got an Xbox one. Those incredibly new Nintendo games that still feel like the games of old, combined with the tons of arcade games we've seen released as well as a whole bunch of brilliant indie games. I have to say, even though I have a Framemeister for my old system, I have to agree that playing on a CRT is still superior. While the XRGB image looks pristine on a big screen, there's still something about it that looks a little off. A bit too clean and sharp I guess. The thing is, setting up a couple of big old CRTs is not the easiest thing to do, so the convenience of having everything on a big flatscreen tv on the wall playable from a nice couch kinda trumps all the hassle I'd have to go through right now to get a nice CRT setup going. Oh, I almost forgot. 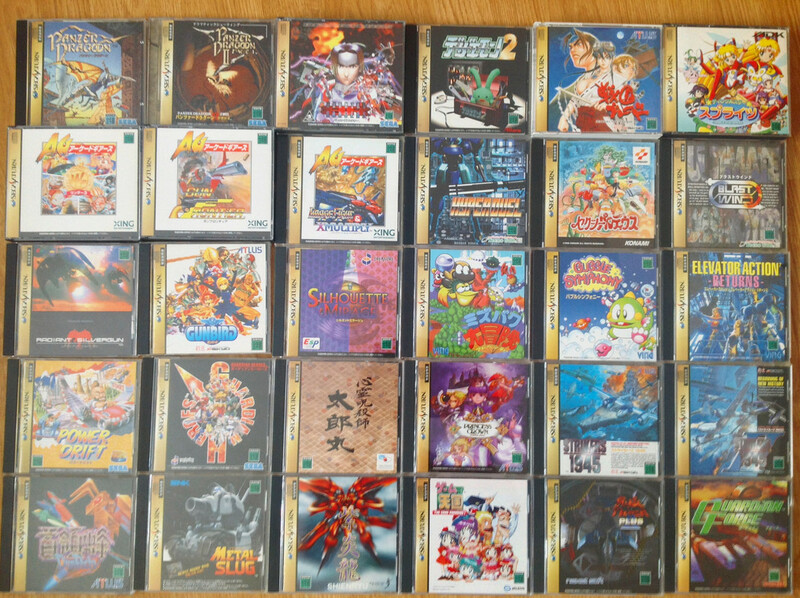 I took a whole bunch of picture from my Japanese Sega Saturn, Dreamcast and even PSone sets. I don't want to post them all at once as it would clog up the board a bit too much, so I'll spread them out a little. I was gonna do a list of names for the games where it's not clear how they are called, but that would take way too much time. So we'll do it this way: if you want to know a certain title, name a game that's next to it and I'll post it. That way it'll be a lot easier. @meppi64 Agreed, it comes and goes for me too - it's just so nice to know it's there when you need to recharge, like you say. I totally get not using a CRT as well, they don't suit everyone's living space! I love seeing your amazing collection @Meppi64! 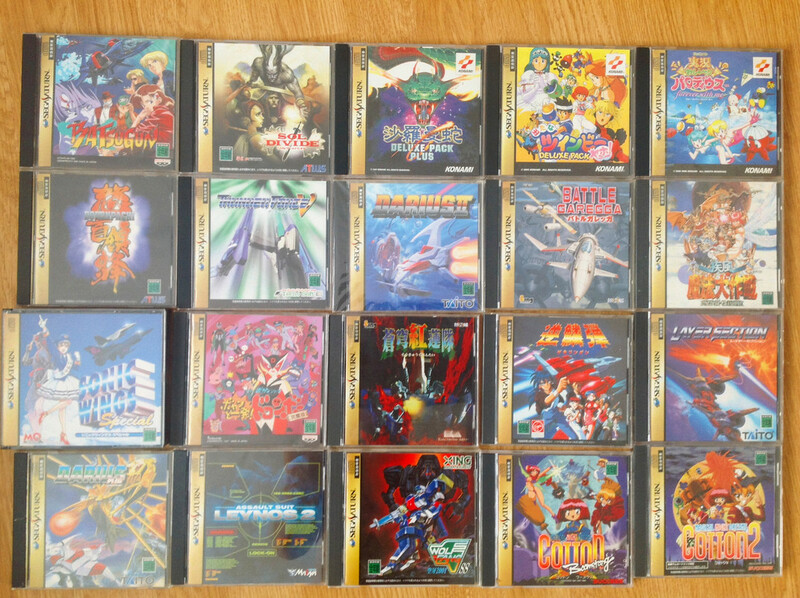 I may have to get some Japanese consoles for all those lovely shooters. I'd also love a PC Engine at some point, I really like the look of the machine. Also, my best Desert time so far is around 56.5 - so I'm a good way off yet!